Many years ago I created a list of the plants that I use most often in my landscape designs. When I design a landscape, I need to make sure that the plants I choose will thrive in our climate and region. 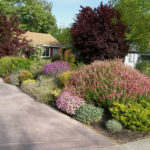 Some of the plants on this list would not be considered ‘drought tolerant’, and yet they survive with the heat and cold and thrive on a drip irrigation system. I use combinations of these plants over and over again, creating a bold, textured, sustainable palate. It’s amazing how when these plants are planted, immediately butterflies and other insects are attracted to them! It’s time to make the change with our landscapes…and here are some wonderful plants that thrive in our California climate! Salvia – ‘Hot lips’ ‘Maynight’, etc.